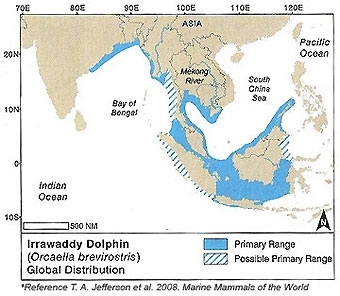 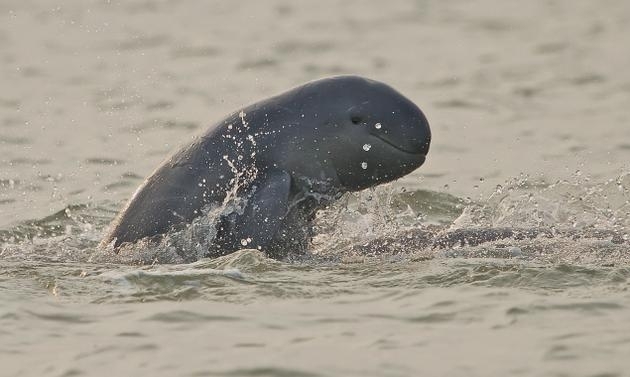 Irrawaddy Dolphins reach 2-2.75 meters in length. 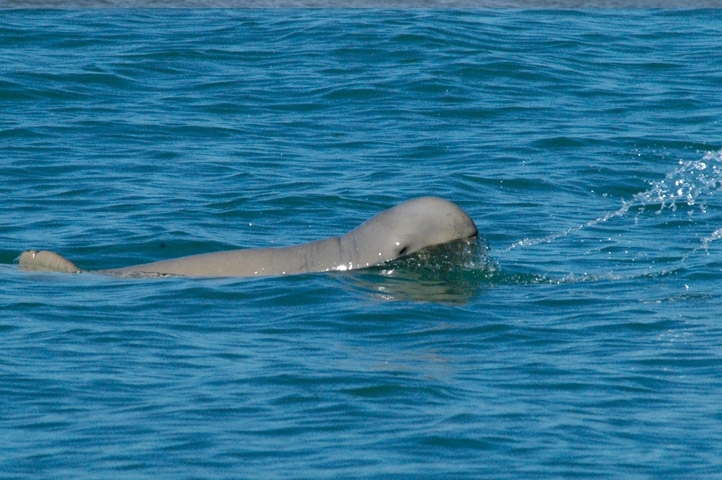 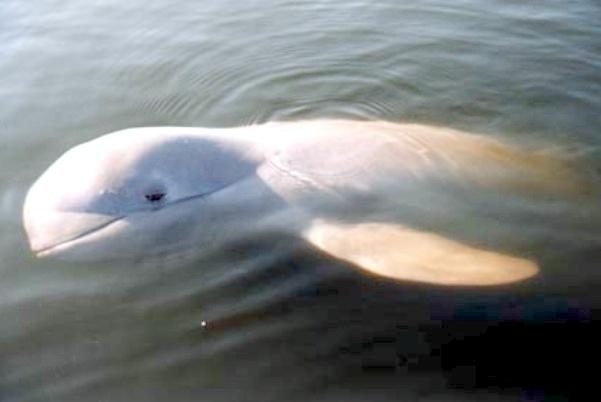 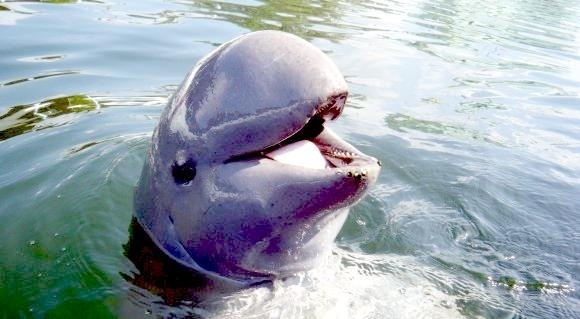 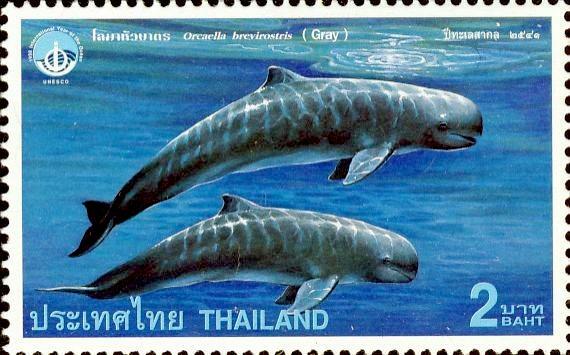 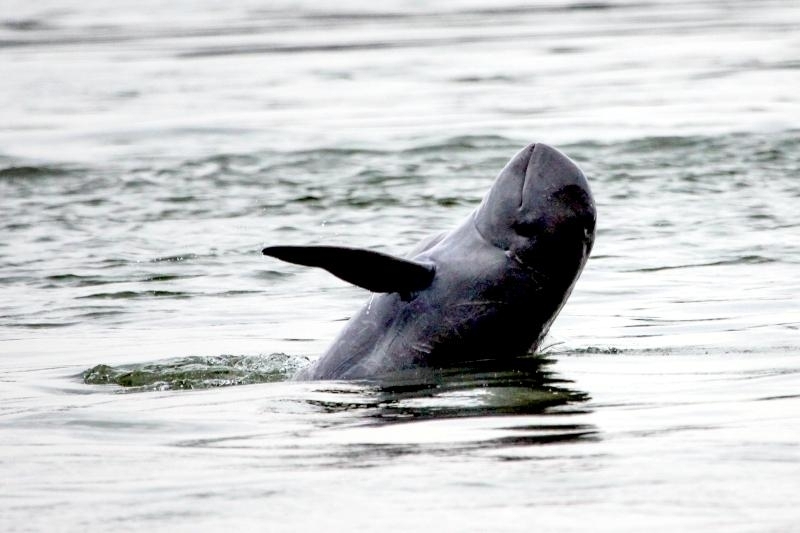 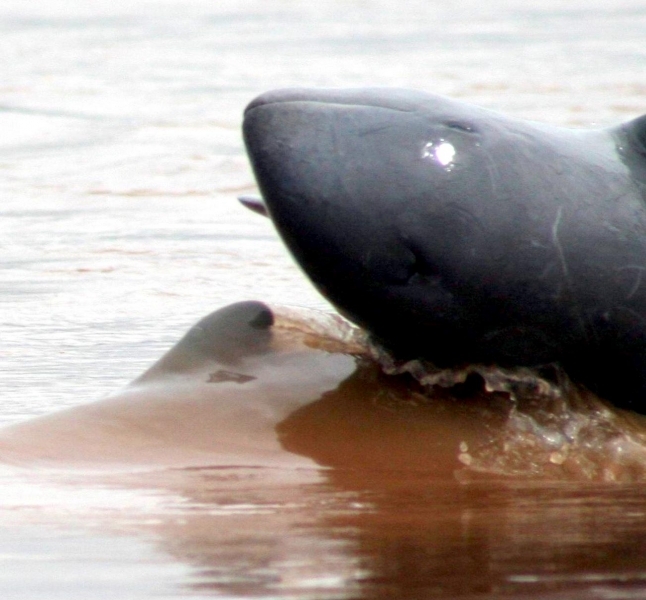 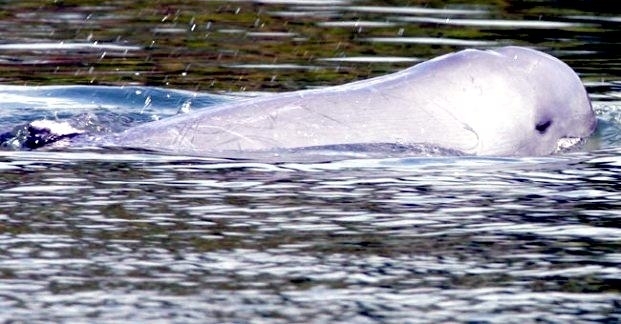 The color of Irrawaddy Dolphins is dark blue to dark gray ranging to pale gray, with a pale ventral (under) side. 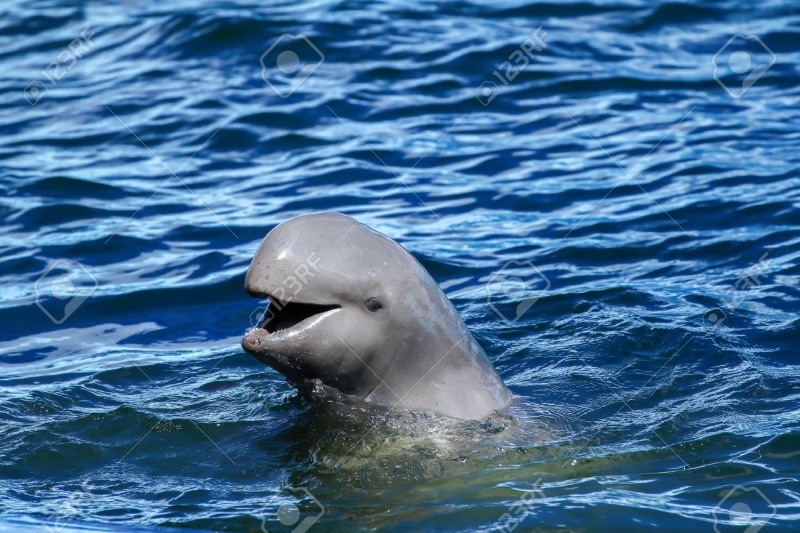 They have a high rounded forehead and no beak. 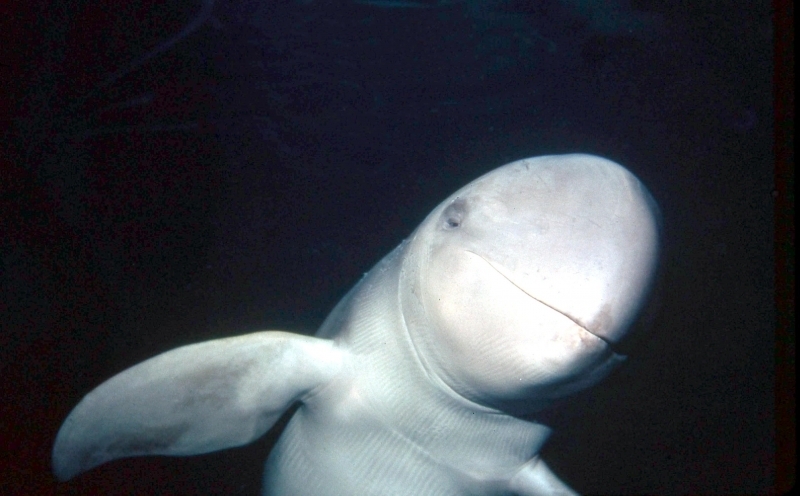 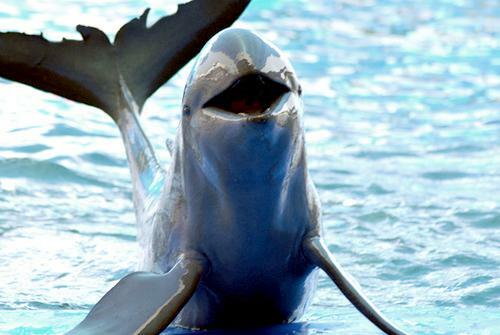 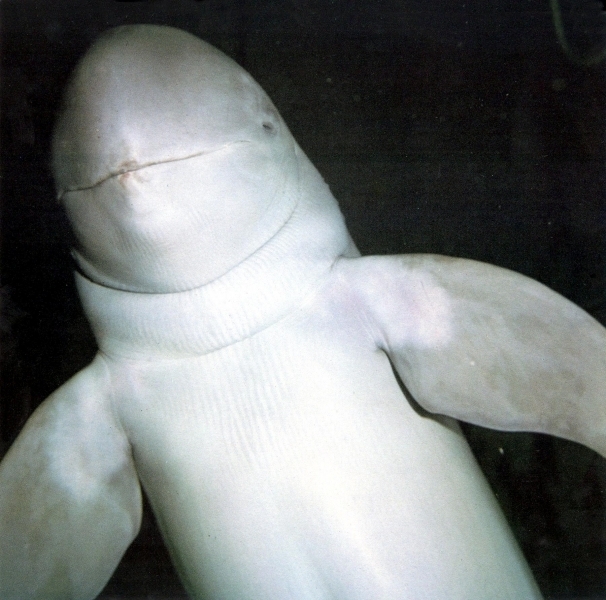 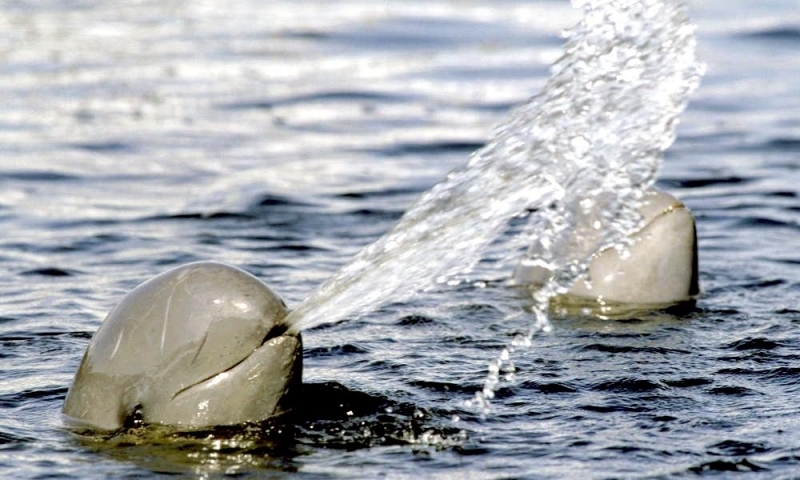 Their U-shaped blowhole is located to the left of the mid-line on their dorsal (upper) side and opens to the front, unlike other species. 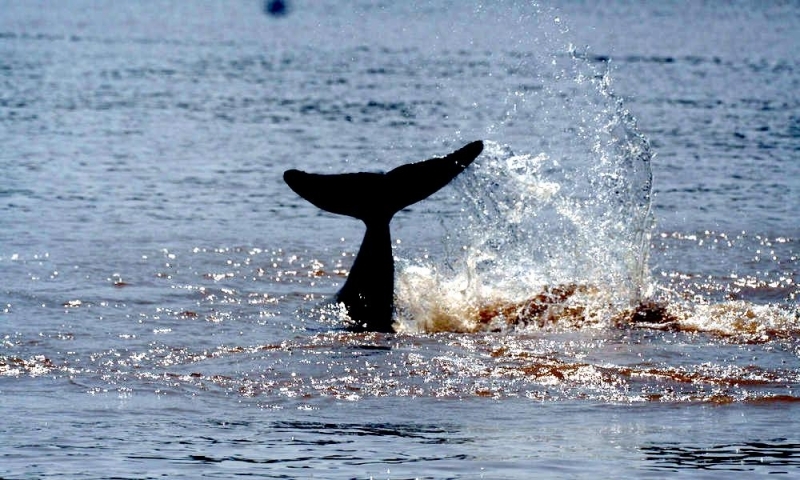 They have a small, blunt, rounded triangular dorsal fin & large flippers. 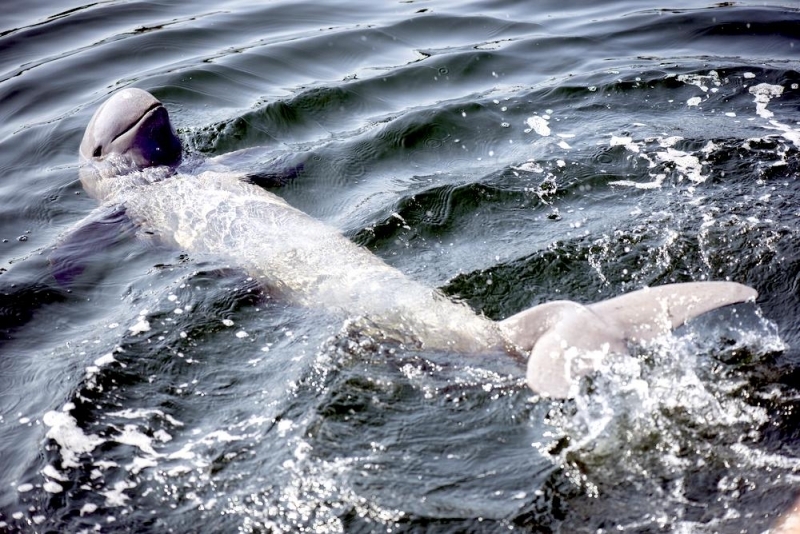 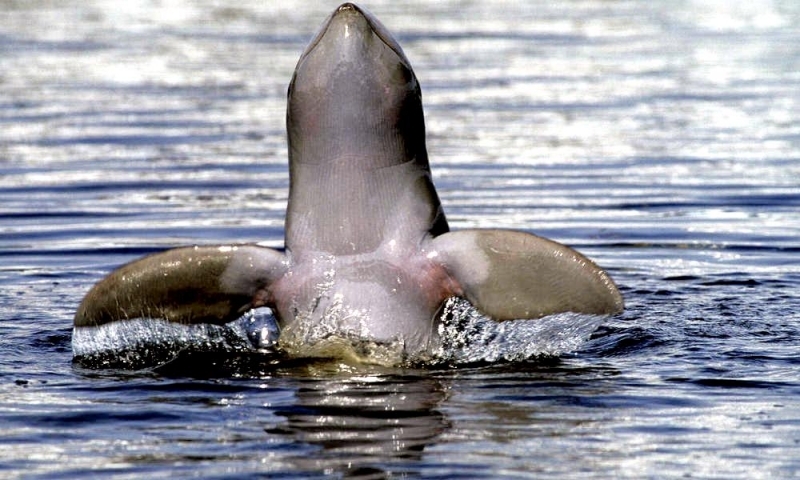 Like other river dolphins, their neck is highly flexible which enables them to forage in shallow water. 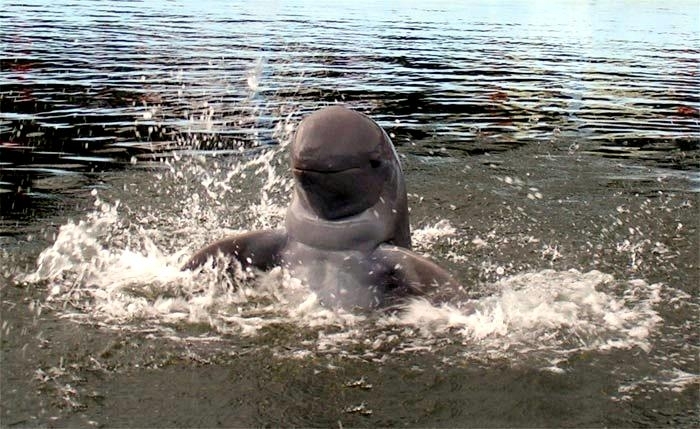 They have narrow, pointed, peg-like teeth about 1 centimeter in length in both their upper and lower jaws. 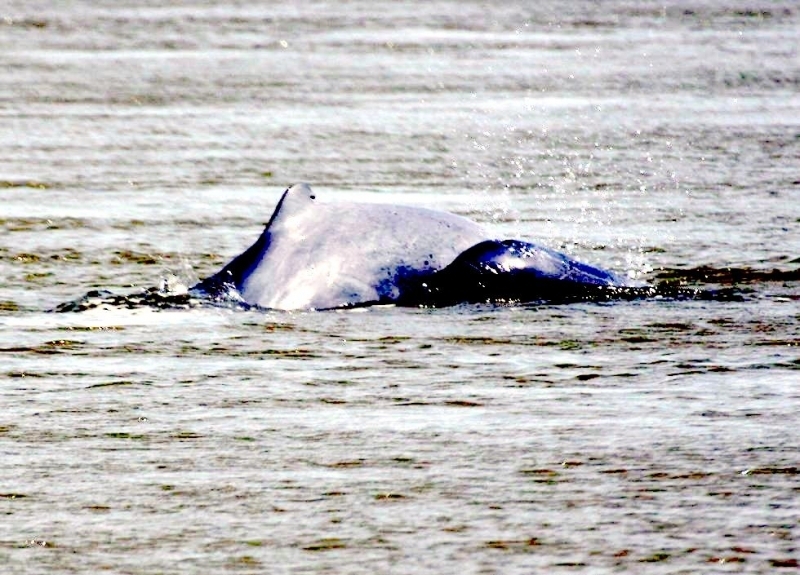 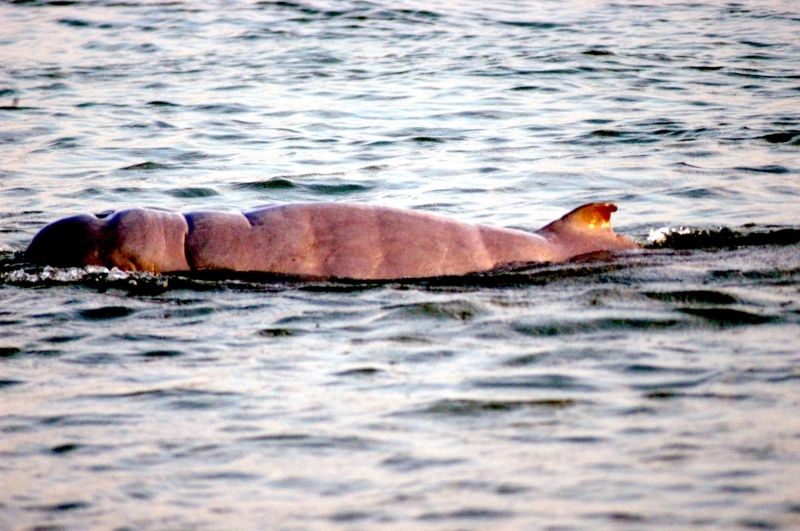 A couple of unique anatomical features of Irrawaddy Dolphins are that they do not have a cardiac sphincter and the stomach is subdivided into compartments. 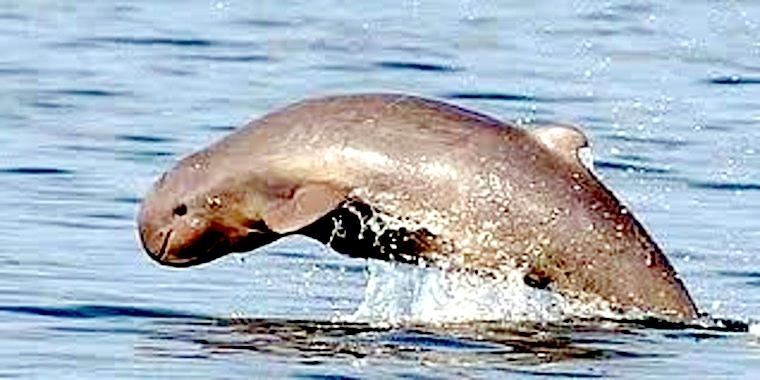 They are not acrobatic dolphins and are not known to bow-ride, however they have been observed leaping from the water. 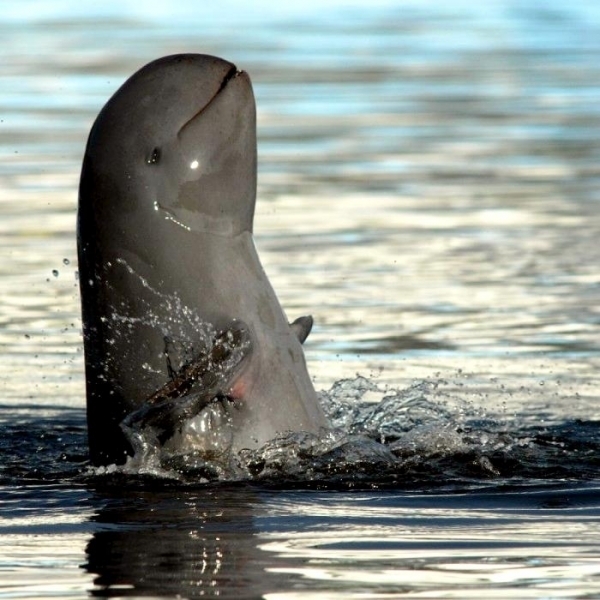 The species gets its name from Myanmar’s (formerly known as Burma) Irrawaddy River where they were first discovered. 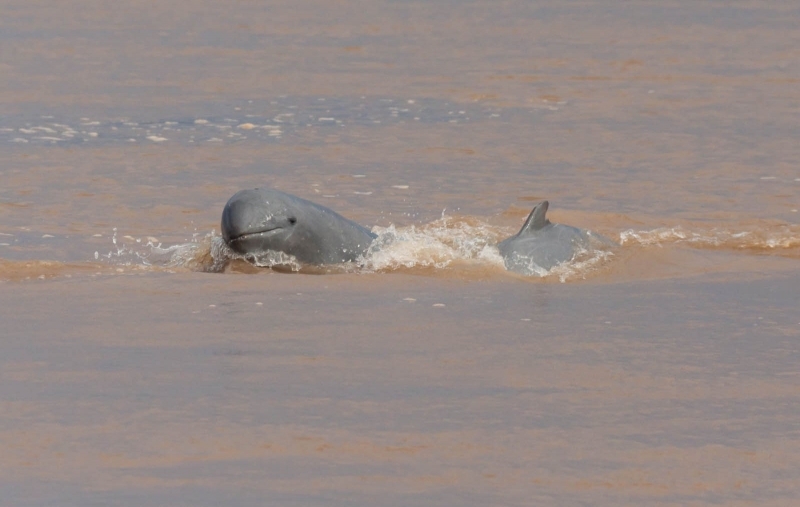 Irrawaddy Dolphins dive for an average of 30-60 seconds but longer dives have been recorded of up to 12 minutes. 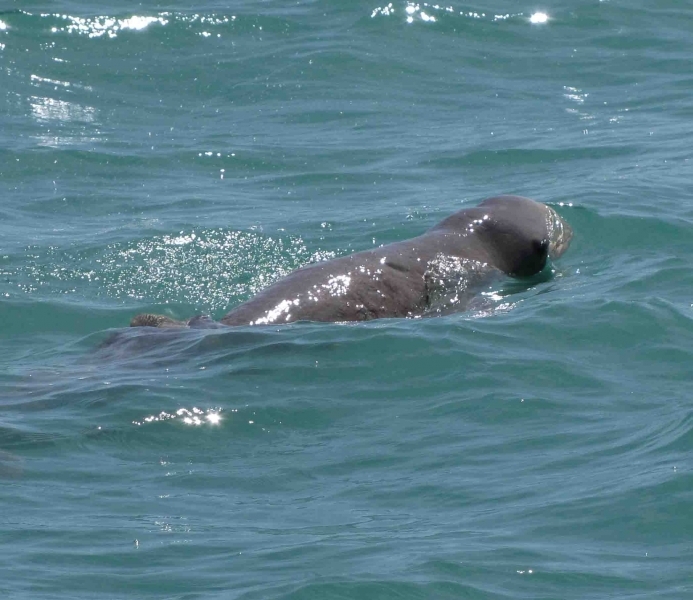 Although they are generally slow swimmers, a swim rate of 25 kph was recorded for one individual. 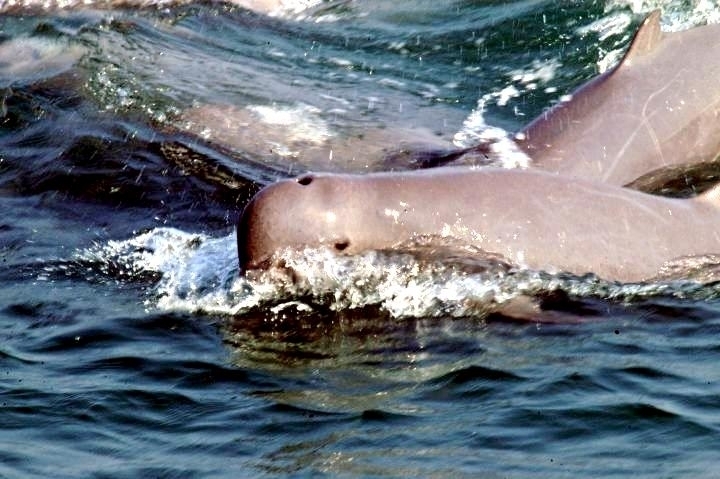 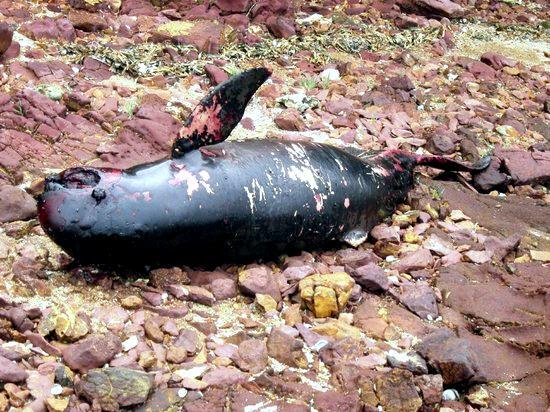 This species is usually seen in small pods consisting of 6 animals, but pods of between 10-15 have been reported. 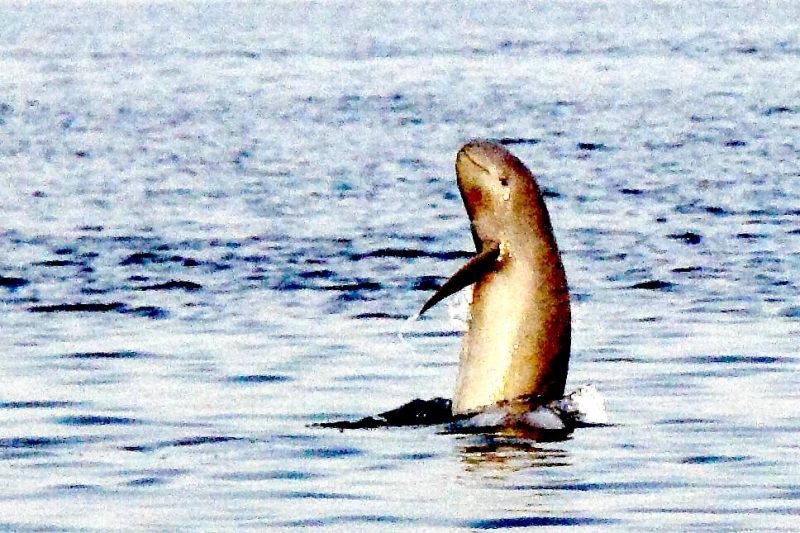 This species spends most of their time feeding. 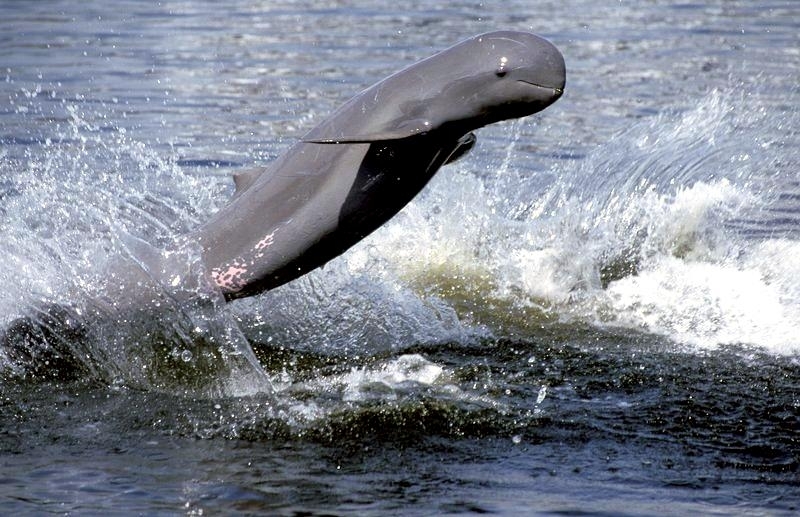 They display a unique behavior of expelling a stream of water up to 1.5 meters which is thought to be used to herd fish. 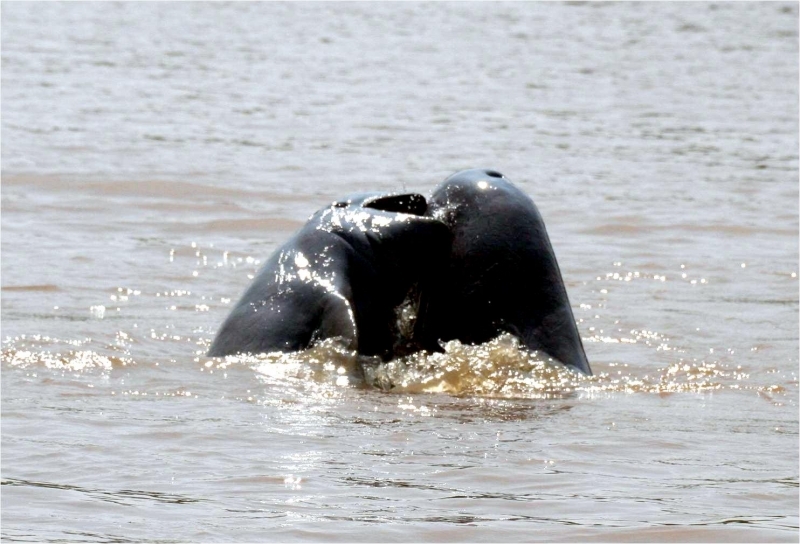 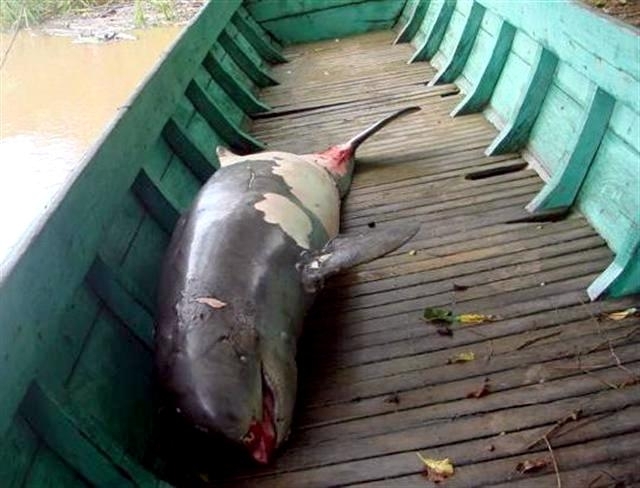 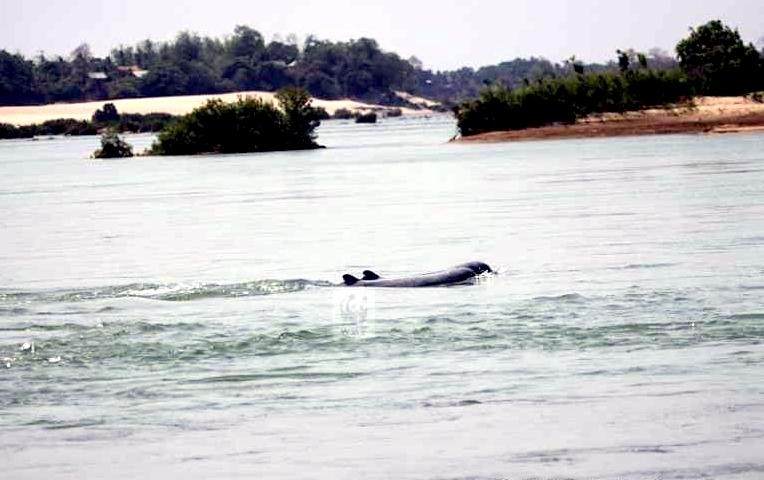 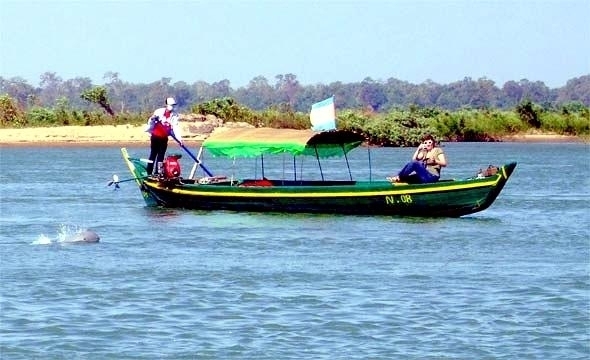 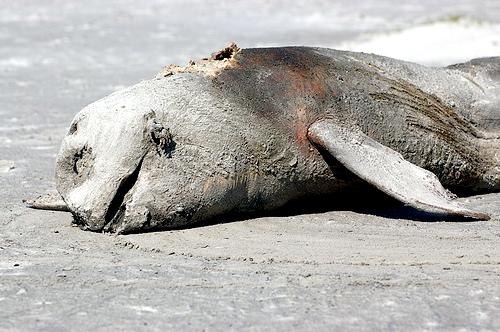 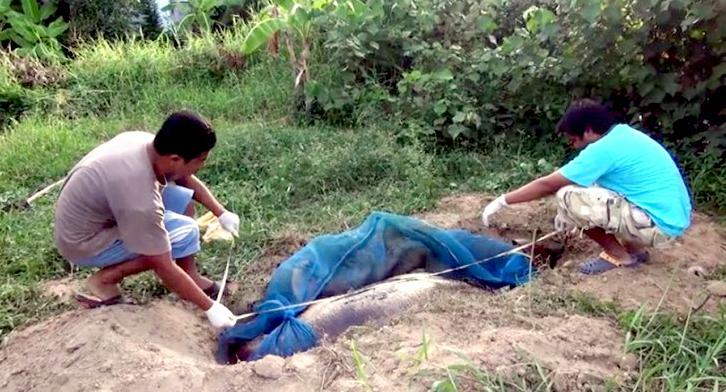 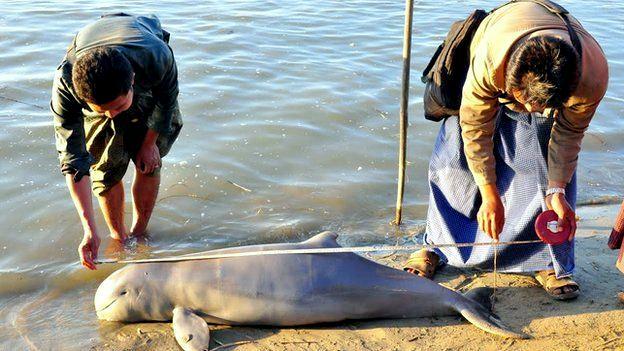 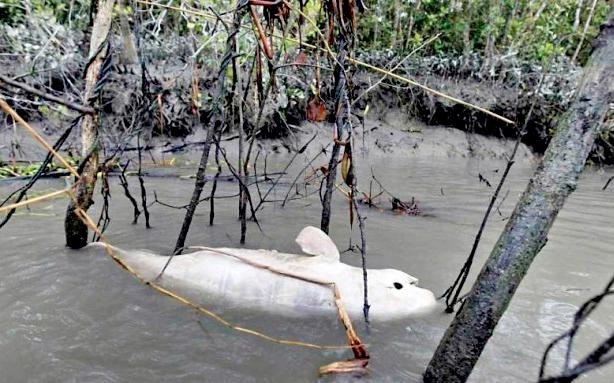 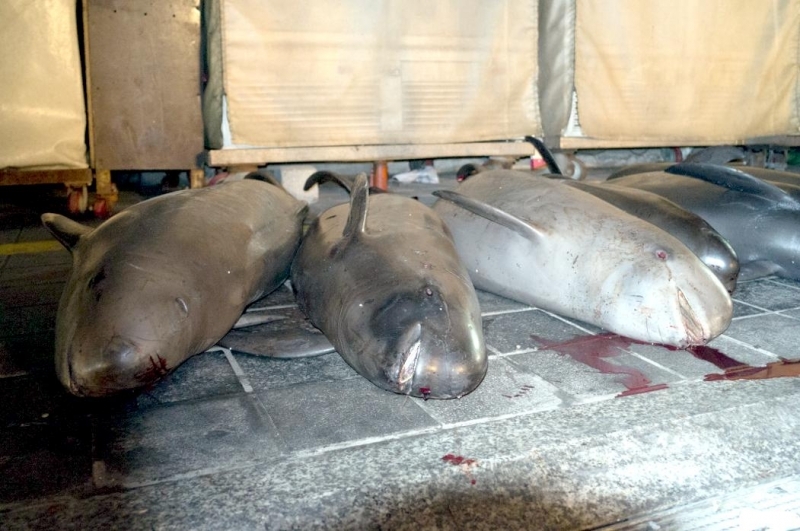 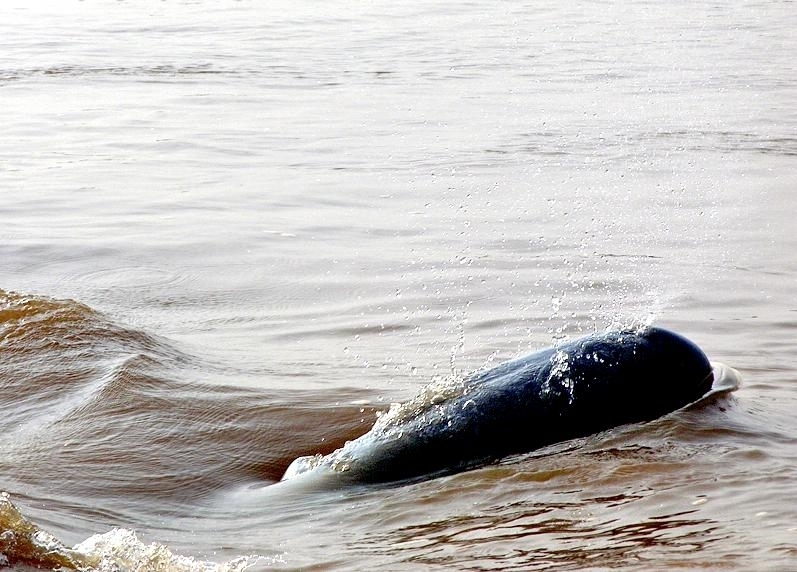 Fishermen have reported Irrawaddy Dolphins stunning large fish then playing with them before they eat them. 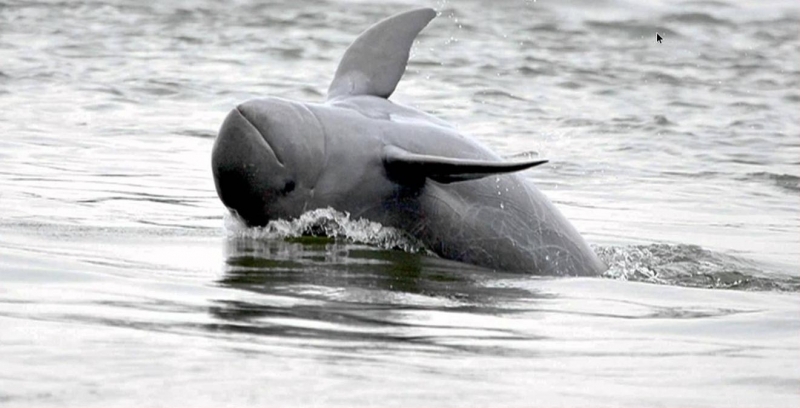 Irrawaddy Dolphins are not thought to communicate through vocal signals and are found in the coastal waters & large rivers of Southeast Asia, Northern Australia and Papua New Guinea. 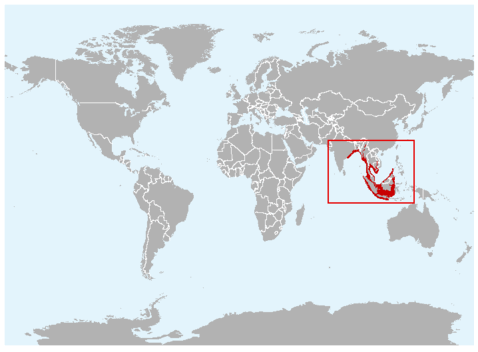 They prefer coastal, brackish & freshwater of the tropical & sub-tropical Indo-Pacific. 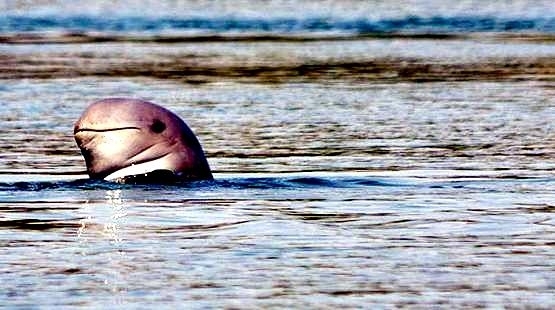 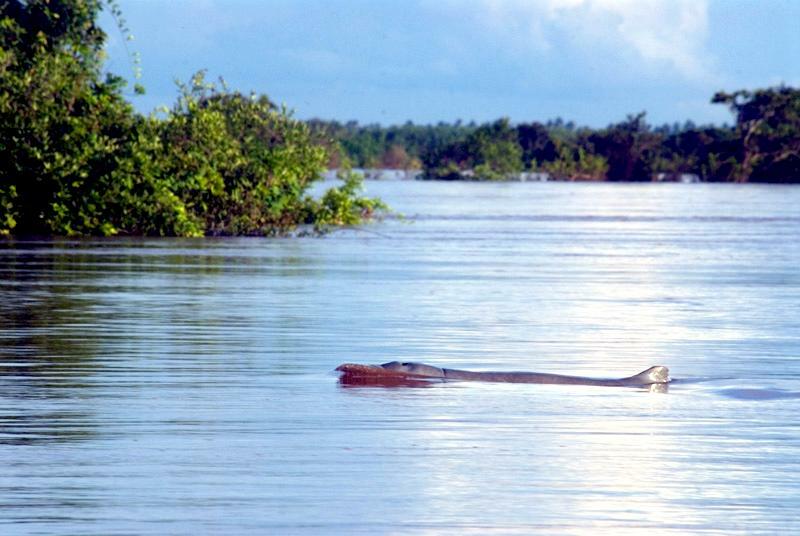 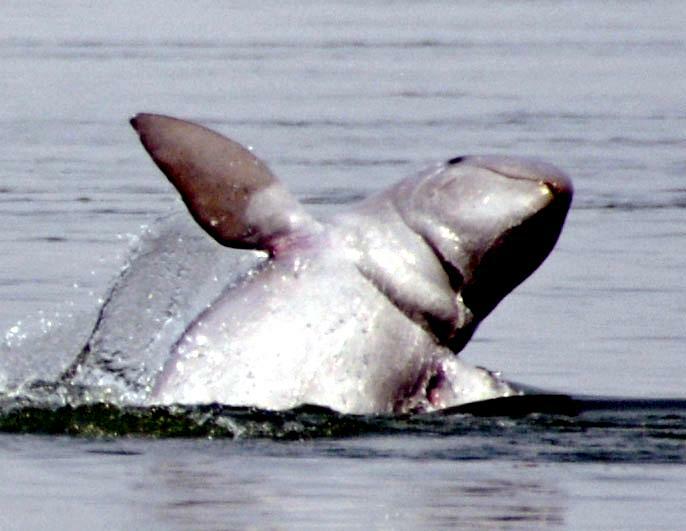 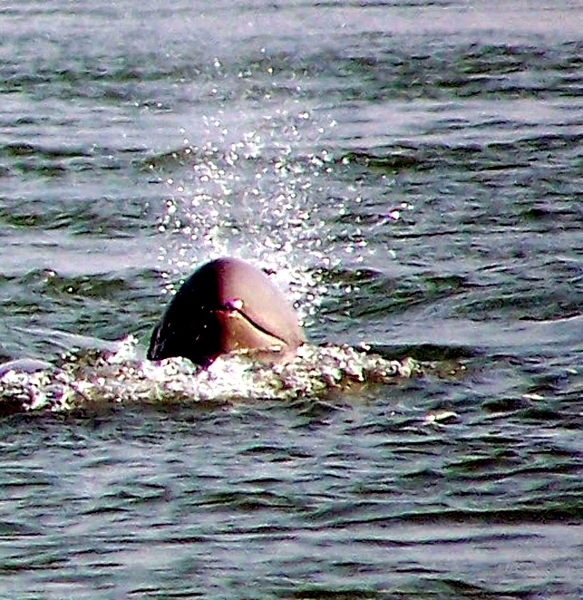 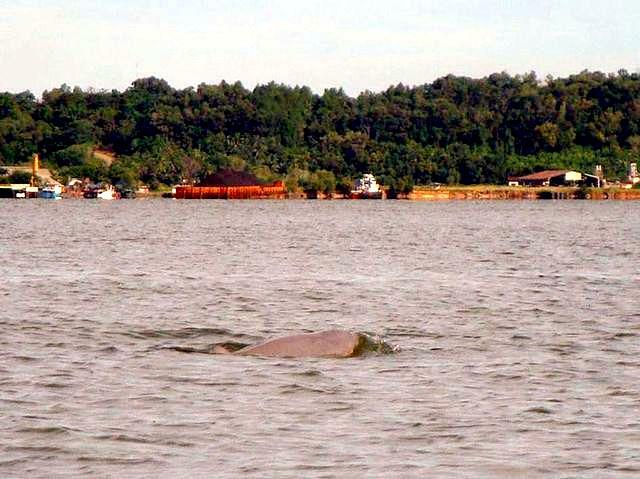 Irrawaddy Dolphins feed on fishes, crustaceans, cephalopods and fish eggs. 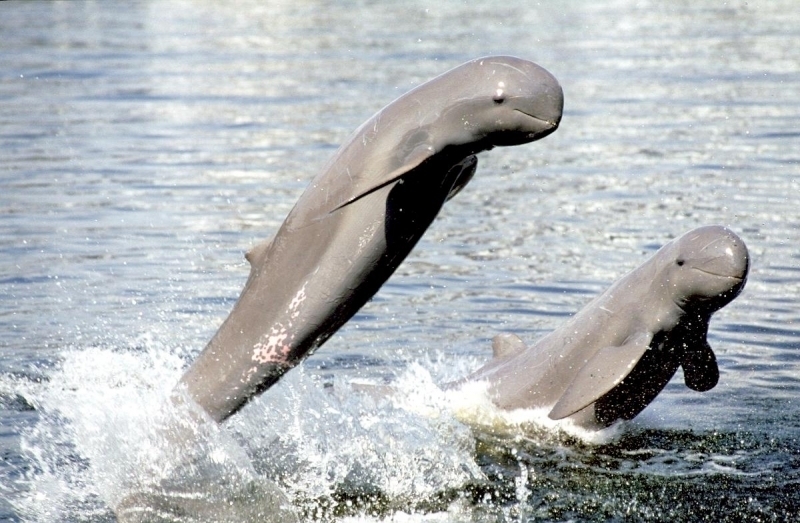 Cyprinid fish are thought to be important food sources for Irrawaddy Dolphins found in northeastern Cambodia & Laos. 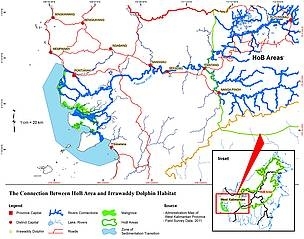 Carp is the primary species consumed in other areas. 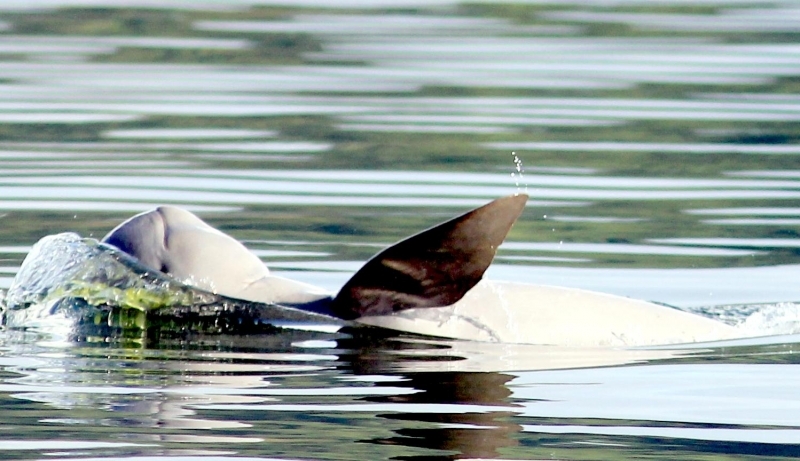 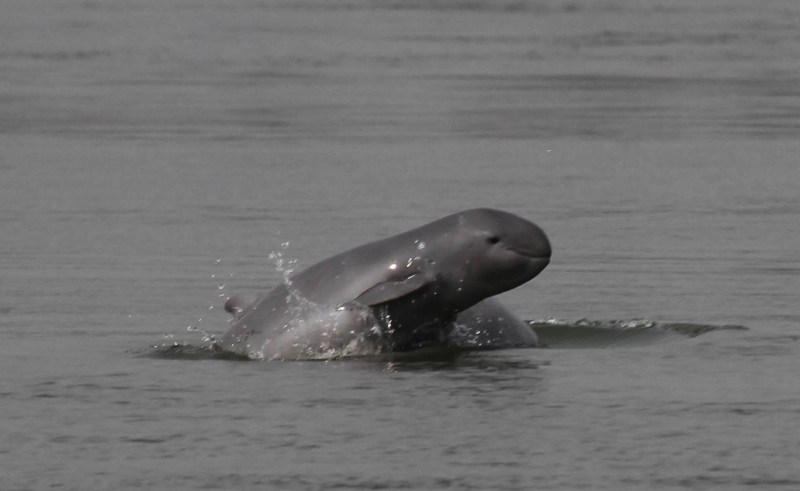 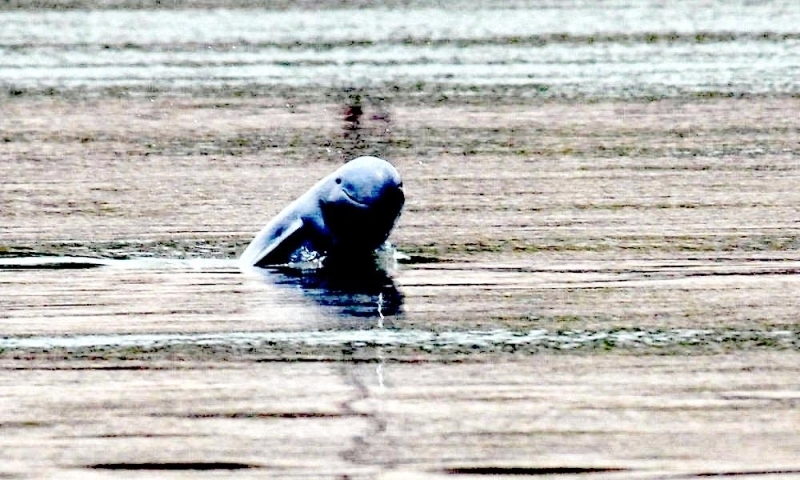 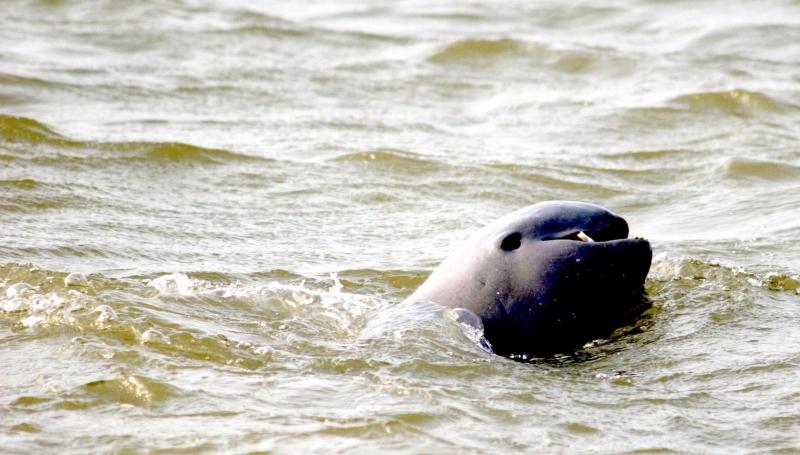 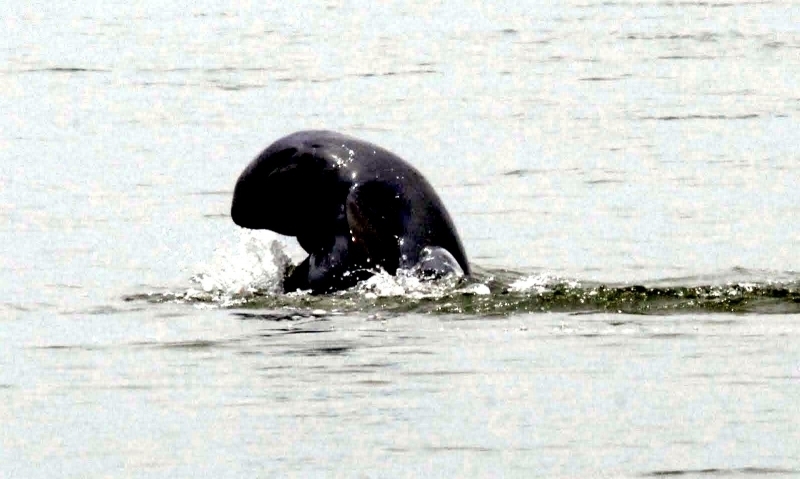 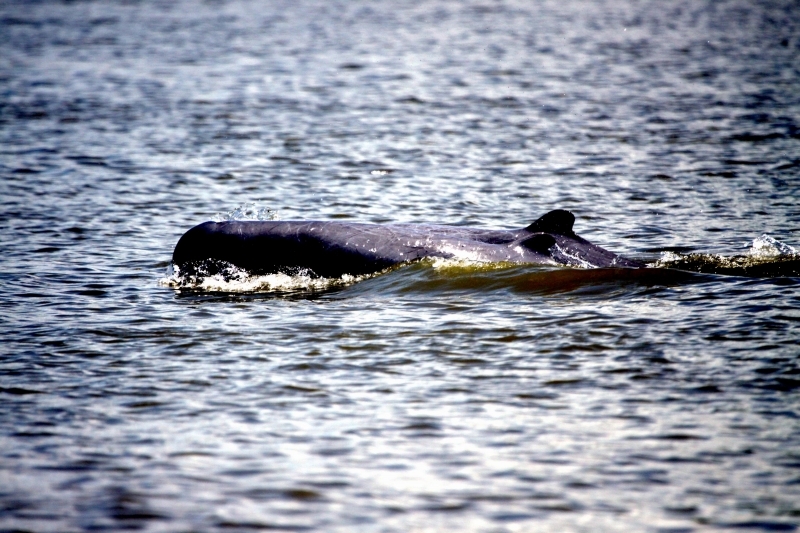 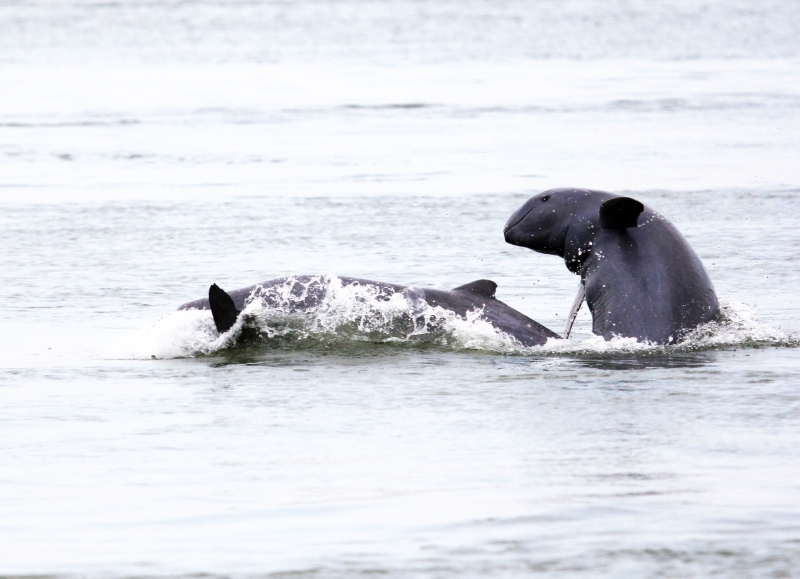 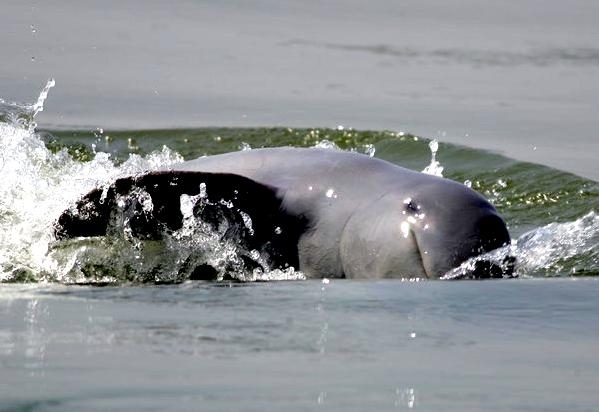 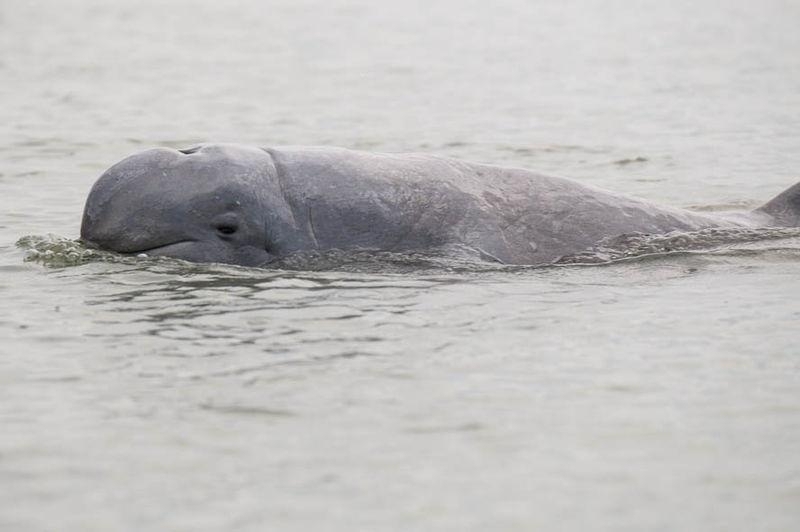 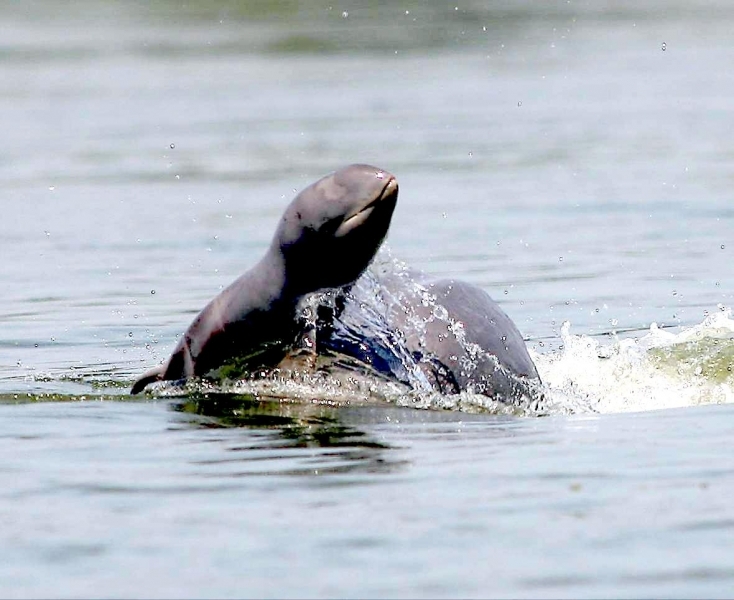 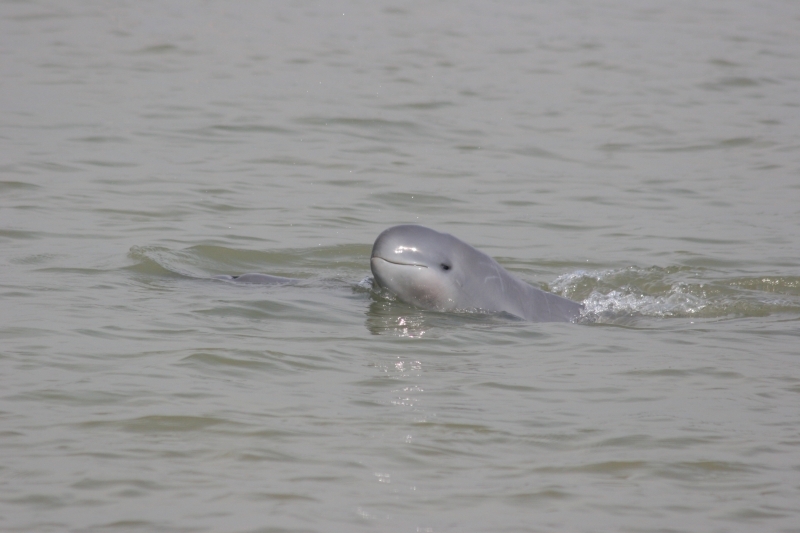 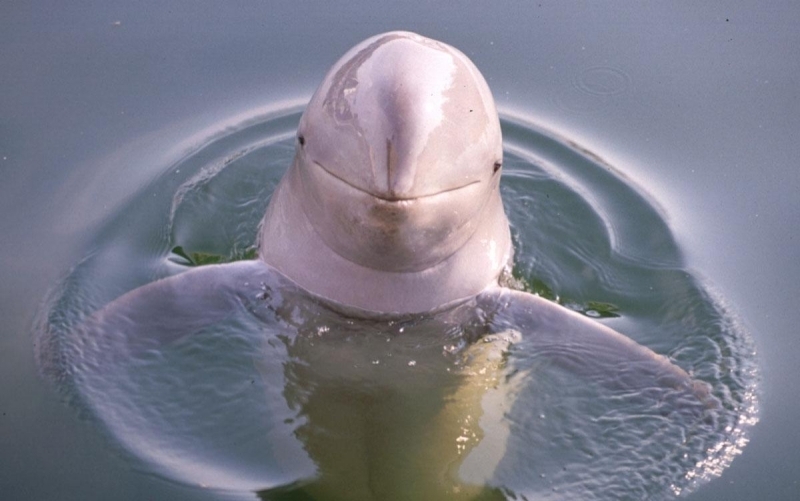 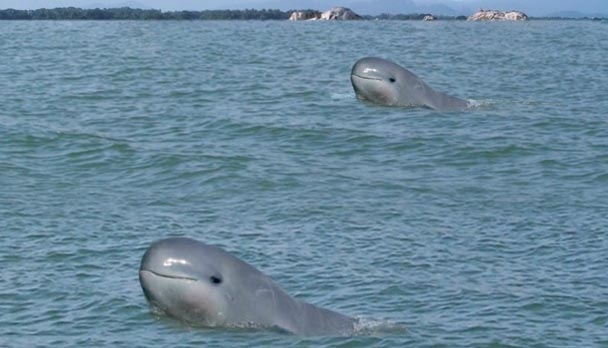 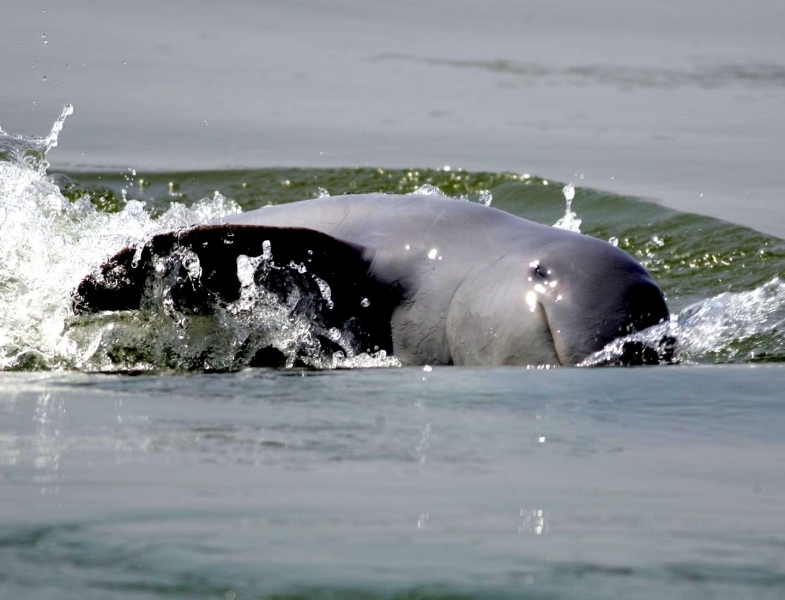 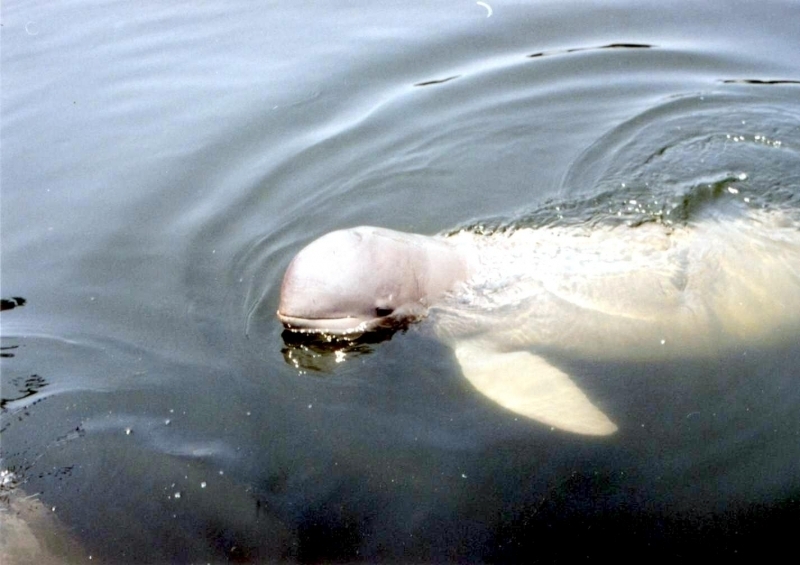 Little is known about the reproductive habits of Irrawaddy Dolphins. 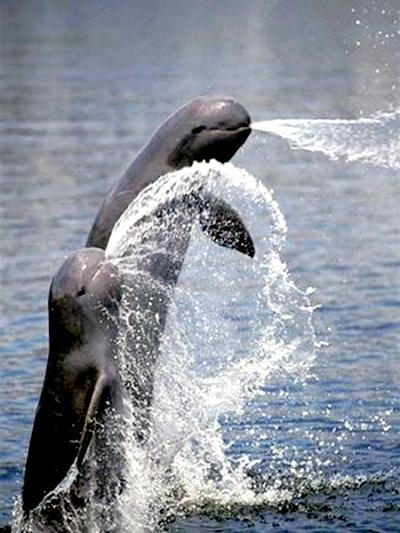 It is thought that they reach sexual maturity when they are around 4-6 years old. 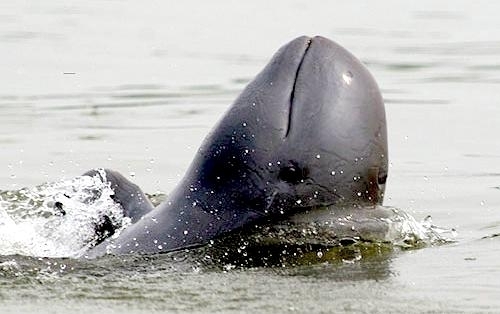 Their mating season is believed to occur between April-June in the Semayang Lake & Mahakam River area of Kalimantan, Indonesia based on the birth of calves born in captivity in Jakarta between July-December. 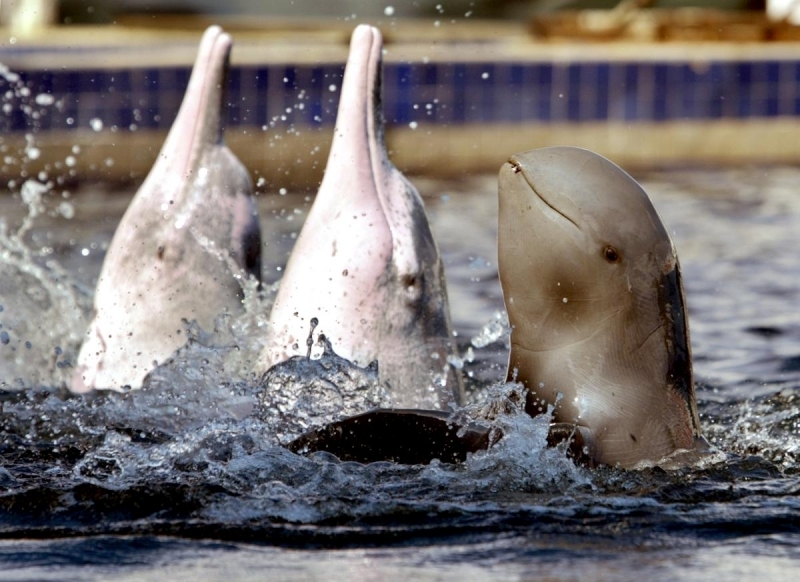 Their gestation period is estimated at about 14 months. 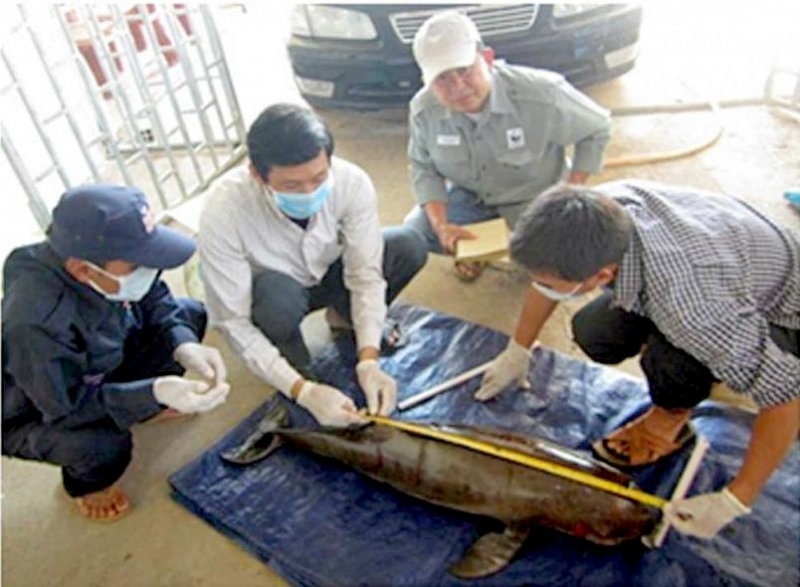 Newborns measured following birth in captivity were 96 centimeters long and weighed 12.3 kilograms. 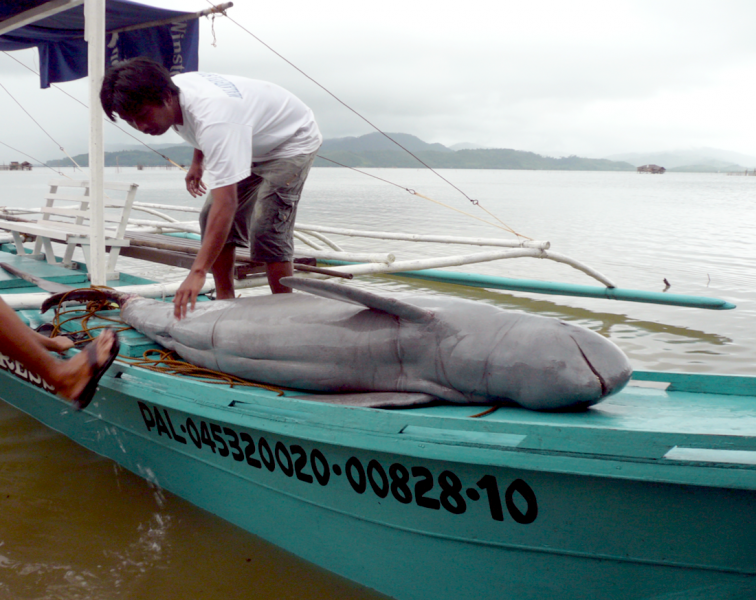 During their first 7 months, calves increased in length by 57 centimeters (59%) and in weight by 32.7 kilograms (266%). 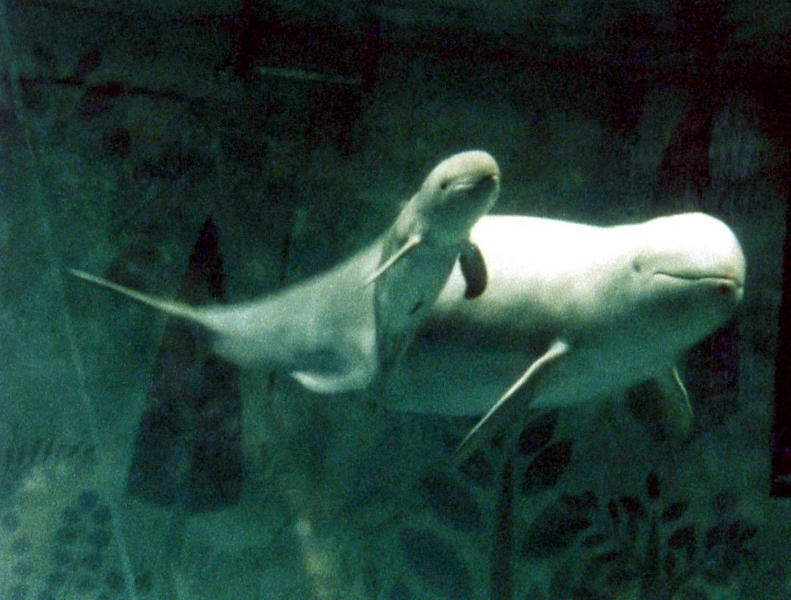 One calf was nursed for about 2 years, although it began consuming fish at 6 months. 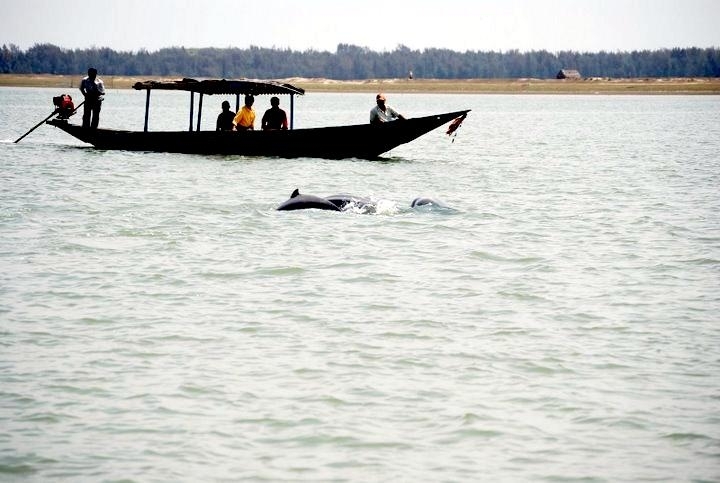 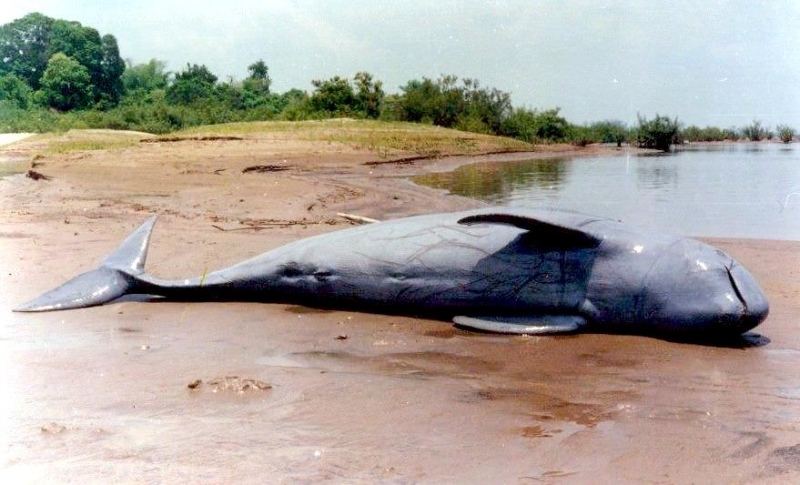 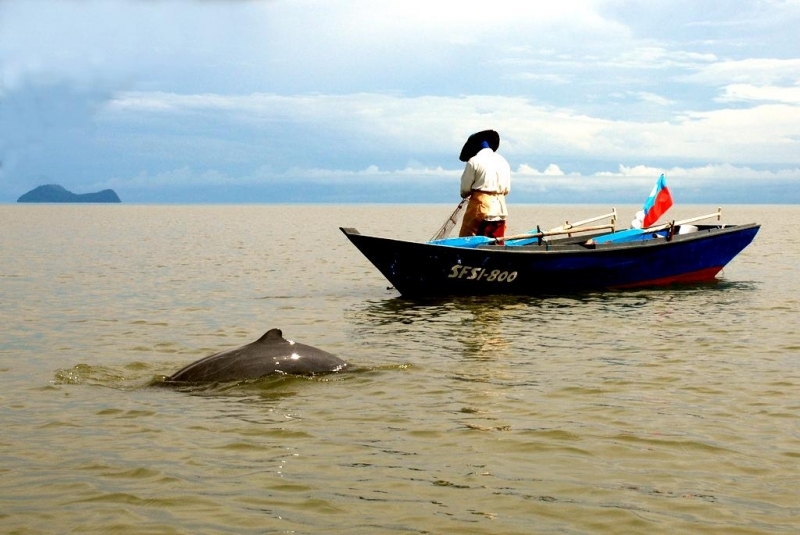 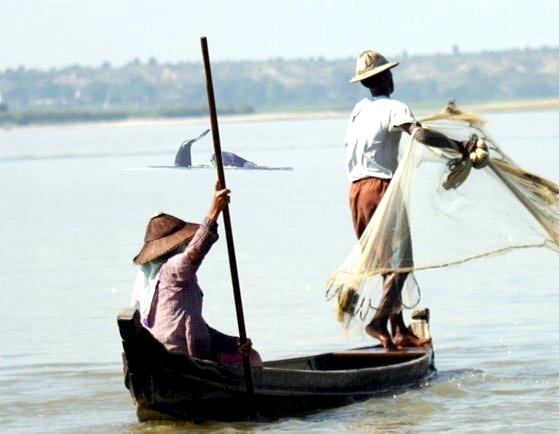 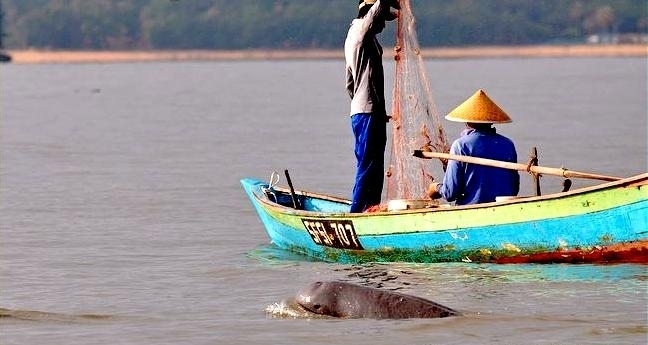 Irrawaddy Dolphins are reported to work with fishermen by herding fish into their nets. 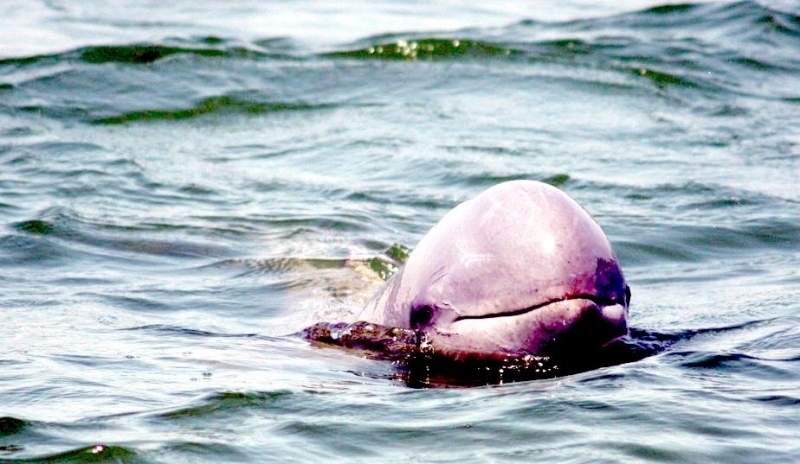 In Burma, these dolphins were observed responding to fishermen who tapped on the sides of their boats signaling the dolphins to begin herding fish into the nets. 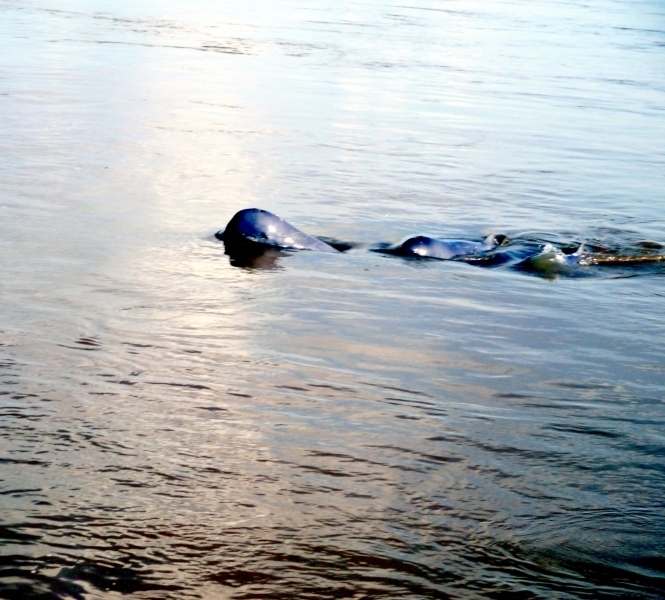 In return, the fisherman share their catch with the Irrawaddy Dolphins.